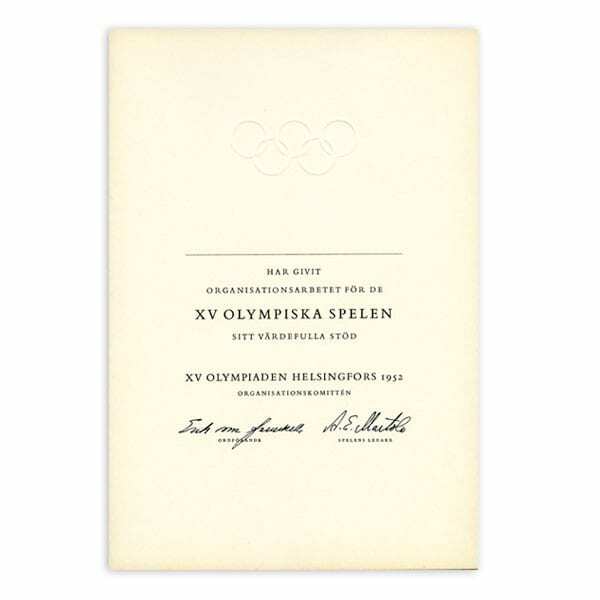 Description: Below the Olympic rings and an empty signature line the text: HAR GIVIT ORGANISATIONSARBETET FÖR DE XV OLYMPISKA SPELEN SITT VÄRDEFULLA STÖD; XV OLYMPIADEN HELSINGFORS 1952; ORGANISATIONSKOMITTÉN. Signatures by Erik von Frenckell and A.E. Martola. Other information: Awarded for services in support of the Olympic Games.